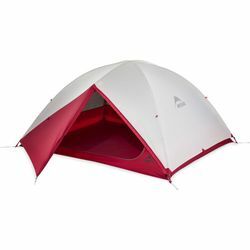 MSR Zoic 3 Backpacking Tent. New for 2019. Making room for up to three people, the Zoic 3 tent is the ideal backpacking tent for trips with family or friends. Designed with extra interior space for stretching out and storing gear, the tent offers plenty of breathing room for everyone. The Zoic 3 tent's full, ultra-breathable micromesh canopy keeps the interior cool and dry, even with three people in the tent. Its quick-pitch hubbed pole system lets you speed through setup, leaving more time for day hikes or just hanging out at camp. Lightweight enough for backpacking the Grand Canyon's South Rim to the Colorado River, but with livability features that make it a comfortable choice for the frontcountry, the Zoic 3 features two easy-access doors and three gear lofts for personalized storage options.